Last Christmas, Alex and I were living in China. Despite Christmas being mostly a low-level sales opportunity for a relatively small handful of Asians, we discovered pockets of decorated trees, twinkling lights, and as shown above, a pack of very Asian-looking Santa Clauses. Of course, the real St. Nick was from what today is Turkey, so it could be argued that their brown-eyed, olive skinned Santa is more historically accurate. Most of the more western-oriented shopping malls and hotels feature elaborate displays of trees and lights, but the average person in China knows relatively little about the holiday. Religious scenes, especially a baby Jesus in a manger and the like are no where to be found and are strictly forbidden in a country with no religion. Alex singing carols at his international school concert last Christmas. Living as an expat in a foreign country makes holidays both familiar and a stranger. Growing up celebrating Halloween, Thanksgiving and Christmas both as a larger community and as a family, the last part of the year seems a special challenge when on an overseas assignment. Living in Asia makes it especially frustrating since so few people could even describe the holidays, let along celebrate them. 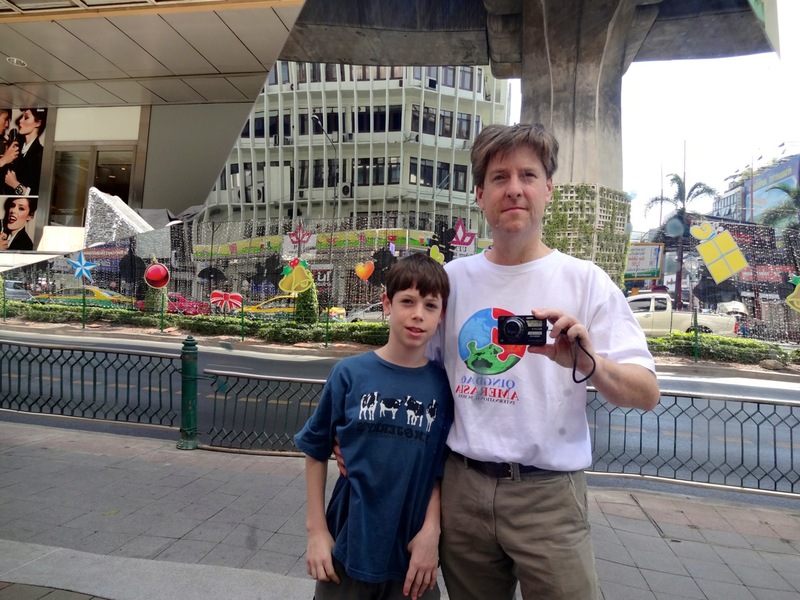 Fortunately, Alex and I were part of a school community that included enough westerners that we could at least share in some of the fun we were missing back home. It felt good to include students and parents who had never heard of Halloween before or knew exactly what Thanksgiving was giving thanks for every November. Just as we celebrated the Moon Festival and ate moon-cakes in October, and watched fake money burned during the ghost festival, and endless nights of seemingly redundant fireworks, we enjoyed sharing a bit of our culture with those curious enough to ask. The decorations at the Intercontinental Hotel in Qingdao, China could pass for Chicago or New York. Living with children overseas, it is especially important to not miss the holidays or at least to shake things up enough and make it harder for them to notice. I decided to try both by celebrating early with a few small gifts, stockings hung by the TV with care, a pint-size plastic tree with strings of lights, and planning a long trip that would help us forget the distance between us and most everyone else we knew in the world. Alex enjoys Christmas carols around the tree in the lobby of our Bangkok hotel. Our longest break of the school year coincided fortunately with Christmas and I seized the opportunity for us to leave cold northern China but still explore Asia. I chose for us to spend Christmas and New Year’s in sunny, warm, and friendly Thailand, arguably our best trip of the year. A buddhist shrine outside our hotel. Starting and ending in Bangkok, we spent Christmas in a hotel just off the Skytrain route and blocks from the central MBK shopping district. Our hotel near the US embassy even provided an earnest, if not mildly awkward Christmas Eve concert by an all-Thai choral group and a curious mix of Thai and western foods. The kids even received small gifts from a very evenly-tanned and slight St. Nick. The crowd was a United Nations mix of travelers and locals seeking out a bit of jolly camaraderie in a city where the daytime highs reach into the mid 80’s in December. It was in no way beginning to look a lot like Christmas. 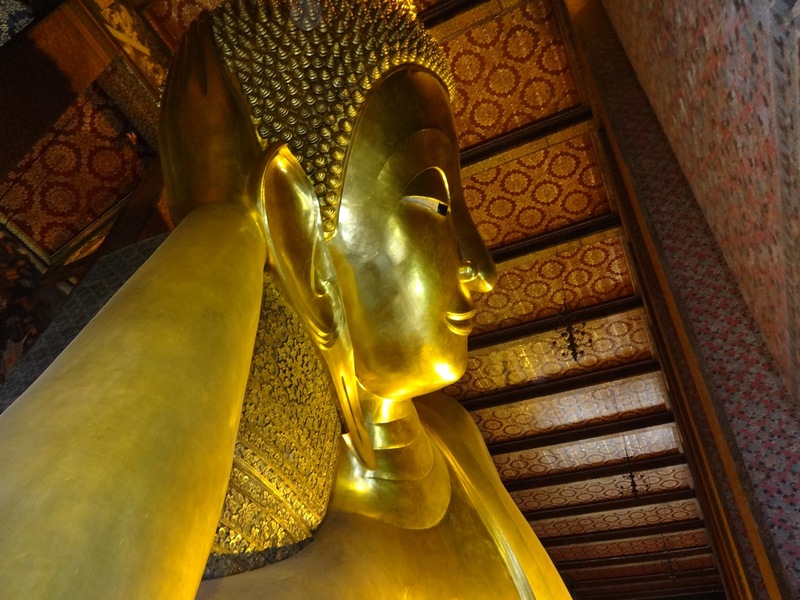 Standing under the Skytrain in central Bangkok, we celebrated Christmas by visiting the Reclining Buddha at Wat Pho. 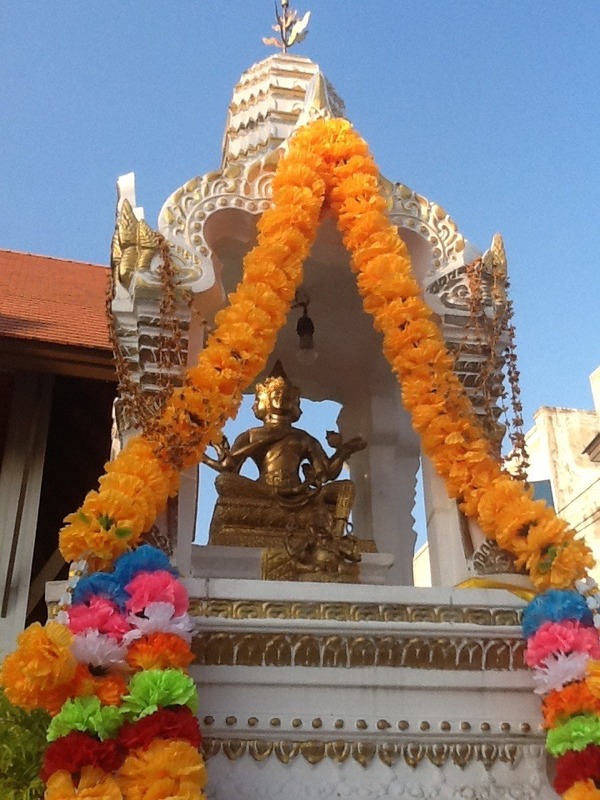 Wat Pho is located behind the Temple of the Emerald Buddha and a must-do for any visitor to Bangkok. It’s one of the largest temple complexes in the city and famed for its giant reclining Buddha that measures 46 meters long and is covered in gold leaf. Most of Christmas day, we spent walking and sweating our way around Bangkok. We visited the Emerald Buddha and the enormous golden reclining Buddha at Wat Pho as well as the Grand Temple just next door. I let myself get conned into what turned out to be a private long-tail boat ride on the brown Chao Phraya river and passed along the beautiful Wat Arun or Temple of the Dawn as well as views of the Grand Temple and the distant Golden Mount temple known as Wat Seket. Floating markets shadowed our trip and tempted us with overpriced drinks and snacks, but the air was warm and the views sublime from the water. I guess Alex one day might look back and say he would have rather been parked under a Christmas tree back home, plying through his new games and gadgets, but I would think he would be very happy his father gambled some and created an undoubtedly different holiday for him that year when he was just 12 years old. 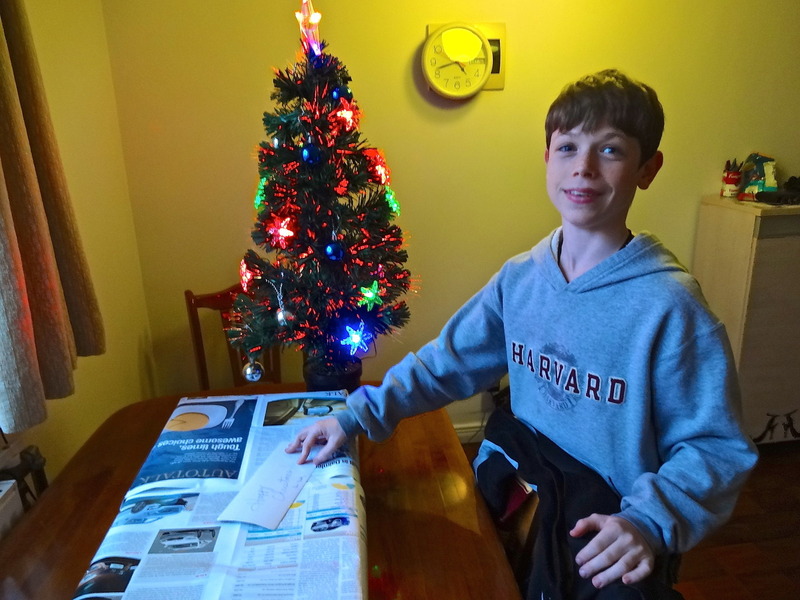 Alex calmly prepares to open an early Christmas present before our trip to Thailand. The day after Christmas Alex got the best gift I could give him: An overnight train ride northwest to Chiang Mai and the chance to take care of wild elephants at the Elephant Nature Park sanctuary. I have written previously about our amazing experience there in a two part story at https://ontheroadtohome.wordpress.com/2013/06/15/big-love-part-1-of-2/. Later we would head to the warm waters and beaches of Hua Hin south of the capital to celebrate the new year, but that is for another chapter. Passing an inbound train on the outbound overnight train from Bangkok to Chiang Mai. Back in smoggy and sunless China and just hours before school and work would begin again for us both, we were reminded what winter felt like and that it included cold wind and dirty snow. 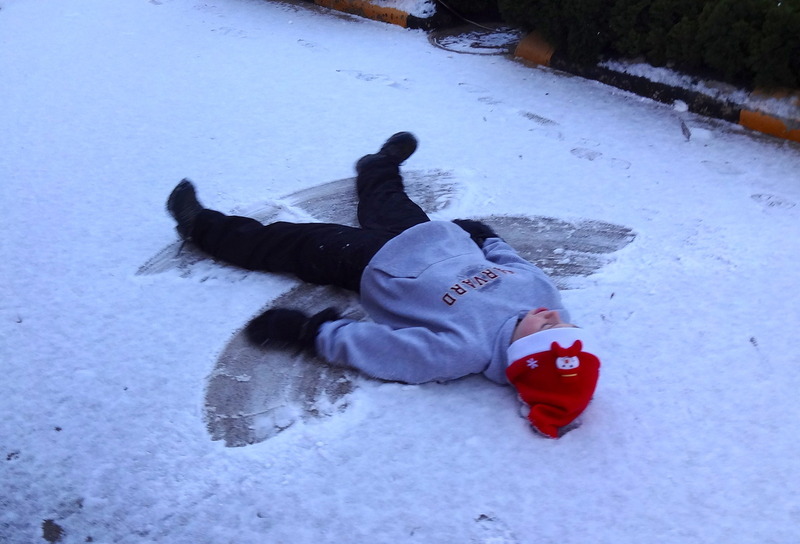 Instead of lamenting about our recent days spent bathing in blue skies and the heat and light of tropical jungles with elephants no less, Alex instead made snow angels-an inspiring start to a new year. Another well written article. Keep them coming.